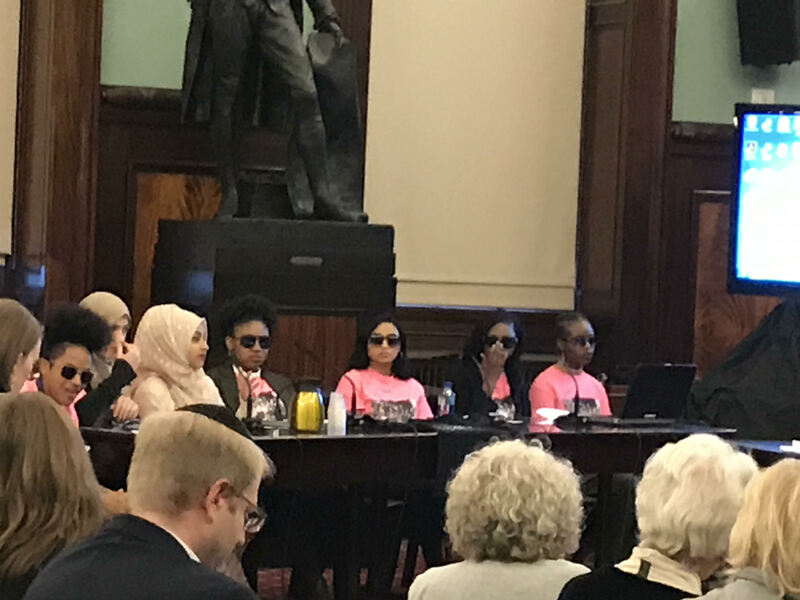 Students from IntegrateNYC told the City Council that the city isn't doing enough to integrate public schools. Advocates for school integration--including parents, students and City Council members—are pressing the Department of Education to take a more aggressive approach to make schools welcoming to children of different races and ethnicities. At a Dec. 7 City Council hearing, a raft of speakers said the DOE’s current plan to make schools more diverse is too timid. Half a dozen high school and college students, part of a group called IntegrateNYC, called for “culturally-responsive education” in New York City and recalled the battles for school integration 70 years ago. They wore sunglasses and neon pink t-shirts emblazoned with the iconic photo of the Elizabeth Eckford, who walked through angry mob to integrate a high schooI in Little Rock, AK, in 1957. IntegrateNYC advocates for the “Five R’s” of integration, which include addressing issues of racial and economic segregation in schools through improved race and enrollment policies, resource allocation, relationships with families, restorative justice practice, and representation on staff. DOE Deputy Chancellor for Strategy and Policy Josh Wallack defended the city’s diversity plan, saying it has “significant but achievable” goals. Testifying at the hearing, he pointed to a plan to for “controlled choice,” designed to better distribute poor and well-off children among elementary schools on the Lower East Side. LaShawn Robinson, executive superintendent of DOE's Office of Equity and Access, said the city’s DREAM program has stepped up efforts to prepare more black and Latino students for the specialized high school exams and has launched an initiative to offer Advanced Placement classes in all high schools. He said 26 percent of all black and Latino students offered a placement at one of city’s seven specialized high schools participated in the DREAM program. Students in the AP for all Initiative represent 29 percent of all black and Latino students who pass AP exams. Public Advocate Letitia James called for the DOE to appoint a “chief diversity officer” to take a more comprehensive approach to tackle school segregation. Councilman Ritchie Torres of the Bronx faulted the city for using the word “diversity” instead of “segregation” or “integration” in its plan. “I worry that we’re white-washing the historical context of racial segregation,” Torres said. Councilman Mark Treygor called on the city to include charter schools in any plan to eliminate school segregation. InsideSchools’ Nicole Mader testified that school choice plays a role in school segregation. “The city’s elementary schools are even more segregated than its housing,” she said, pointing out that only 60 percent of students citywide attend their zoned school. The families that leave tend to be wealthier and whiter than those who stay. Read Mader’s full statement here.